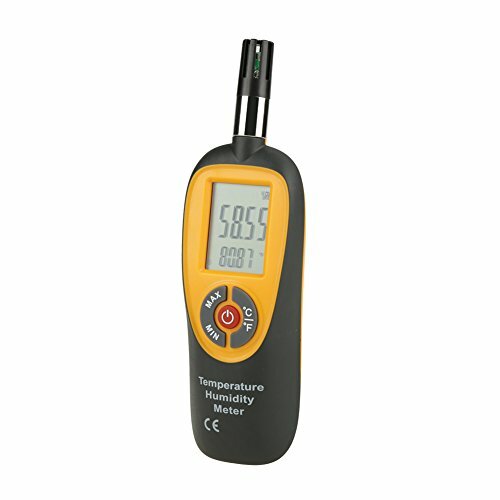 Lightweight and easy to hold, It is designed to combine the functions of digital hygrometer and thermometer widely used in facility maintenance, environmental monitoring, HVAC-service, health care, etc. It takes accurate temperature and humidity readings quickly and conveniently. HUMIDITY AND TEMPERATURE METER: It is designed to combine the functions of humidity meter, temperature meter, wet bulb temperature and dew point temperature. DUAL LCD DISPLAY: Temperature and Humidity dual display with backlight, it is easy to read the measurements in the darkness. EASY TO CARRY: Compact in size, light in weight, easy to carry and handle. High precision and low power consumption. MULTI FUNCTION: Maximum and minimum value measurement mode, Automatic shutdown function, Data retention function, showing temperature and humidity at the same time. APPLICATION: Used for HVAC, industry, agriculture, meteorology, medical, daily life, building engineer, paranormal investigator, in wine cellar, machine room, data storeroom and etc.